There was also another bassist, Al, in the house. We’d been sharing duties – typically, I’d do the the first two or three times through a song then hand over and, later on, take a solo using some bizzare, “what next! ?” combination of FX. 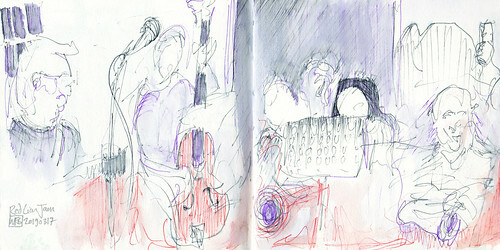 After the midway point, I sat out for a few songs to enjoy a pint and do some drawing. The wash effect here is achieved with a few drops of beer to moisten the felt tips. You’d have to have been there to name the musicians but I’m pleased with the energy and overall balance of the piece. Fairly soon, I’ll have to pick out my next sketchbook and also work out my schtick for it. With this one, I’ve been doing each sketch across a double spread to give a 2:1 or 1:2 ratio. After a sketch I did today of an Orrery at the History of Science Museum in Oxford, I’m pondering the idea of doing field sketches, scanning them for reference and then finishing each one with some follow on painting. I’ve become fairly content with my sketching style but I’ve been slacking off on getting the paints out so that might be a useful driver to push more in that direction.